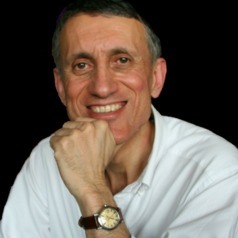 Claudio Paoloni is Professor of Electronics. He is author of more than 160 articles in international journals and conference proceedings in the field of high frequency electronics. He holds one patent (two pending). He is Coordinator of the Horizon 2020 project TWEETHER "Travelling wave tube based w-band wireless networks with high data rate distribution, spectrum & energy efficiency"
He served as Local Organisation Chair of IEEE International Vacuum Electronic Conference 2009 (IVEC 2009) and as Conference Chair of UK/Europe China Millimeter Wave and THz Technology Workshop 2013 (UCMMT2013) held in Rome. He is member of the IEEE Electron Devices Society Vacuum Electronics Technical Committee. He was Guest Editor for the Special Issue of Transaction on Electron Devices on Vacuum Electronics (June 2014). He leads the E-MIT (Engineering of Microwave, Terahertz and Light) group.